Abstract— Service management is critical to balancing the relationship between institutional resources and management processes, improving IT value and promoting strategic alignment between top man agement and the responsible department. 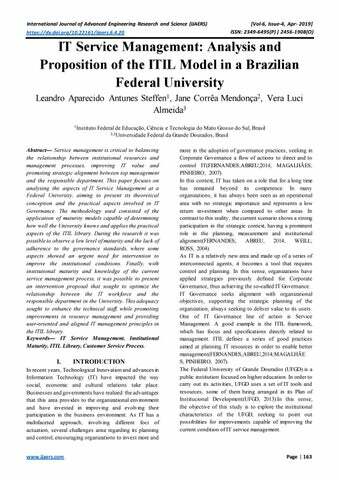 This paper focuses on analysing the aspects of IT Service Management at a Federal University, aiming to present its theoretical conception and the practical aspects involved in IT Governance. The methodology used consisted of the application of maturity models capable of determining how well the University knows and applies the practical aspects of the ITIL library. During the research it was possible to observe a low level of maturity and the lack of adherence to the governance standards, where some aspects showed an urgent need for intervention to improve the institutional conditions. Finally, with institutional maturity and knowledge of the current service management process, it was possible to present an intervention proposal that sought to optimize the relationship between the IT workforce and the responsible department in the University. This adequacy sought to enhance the technical staff, while promoting improvements in resource management and providing user-oriented and aligned IT management principles in the ITIL library. Keywords— IT Service Management, Institutional Maturity, ITIL Library, Customer Service Process. more in the adoption of governance practices, s eeking in Corporate Governance a flow of actions to direct and to control IT(FERNANDES;ABREU,2014; MAGALHÃES; PINHEIRO, 2007). In this context, IT has taken on a role that for a long time has remained beyond its competence. In many organizations, it has always been seen as an operational area with no strategic importance and represents a low return investment when compared to other areas. In contrast to this reality, the current scenario shows a strong participation in the strategic context, having a prominent role in the planning, measurement and institutional alignment(FERNANDES; ABREU, 2014; WEILL; ROSS, 2004). As IT is a relatively new area and made up of a series of interconnected agents, it becomes a tool that requires control and planning. In this sense, organizations have applied strategies previously defined for Corporate Governance, thus achieving the so-called IT Governance. IT Governance seeks alignment with organizational objectives, supporting the strategic planning of the organization, always seeking to deliver value to its users. One of IT Governance line of action is Service Management. A good example is the ITIL framework, which has focus and specifications directly related to management. ITIL defines a series of good practices aimed at planning IT resources in order to enable better management(FERNANDES;ABREU,2014;MAGALHÃE S; PINHEIRO, 2007). The Federal University of Grande Dourados (UFGD) is a public institution focused on higher education. In order to carry out its activities, UFGD uses a set of IT tools and resources, some of them being arranged in its Plan of Institucional Development(UFGD, 2013).In this sense, the objective of this study is to explore the institutional characteristics of the UFGD, seeking to point out possibilities for improvements capable of improving the current condition of IT service management. International Journal of Advanced Engineering Research and Science (IJAERS) https://dx.doi.org/10.22161/ijaers.6.4.20 In order to do this, the existing definitions in the ITIL library were used in the current context of the institution, allowing a comparison between the best practices defined by the model and the current condition of the UFGD's IT service management. Finally, the institutional maturity in relation to the ITIL library is presented, as well as proposals for improvement for each of the analyzed aspects. Alongside this, an improved model is showed, based on institutional conditions. II. THEORETICAL FOUNDATION 2.1 ITIL Model The ITIL Model supports the view that organizations are increasingly dependent on IT to achieve their organizational goals. The IT services need to be reliable and of high quality, this requires a good level of management so that availability and reliability are guaranteed(COUGO, 2013; MAGALHÃES; PINHEIRO, 2007). In this sense, IT Service Management becomes a structure of policies, processes and functions that aim to meet the objectives of the organization by offering and supporting information technology services. ITIL was created to systematically and cohesively disseminate proven practices in IT management, and its approach is based on service quality and the development of effective and efficient processes(MAGALHÃES; PINHEIRO, 2007; WEILL; ROSS, 2004). [Vol-6, Issue-4, Apr- 2019] ISSN: 2349-6495(P) | 2456-1908(O) resources seeking efficiency and effectiveness. Reports are prepared on the activities carried out, allowing for future analysis. The process is completely recognized and accepted throughout IT, with a focus on service delivery. Goals are aligned with those of the organization. It is fully mapped, managed and proactive in nature, having its interfaces established and documented. It synthesizes the set of ideas, values, beliefs, practices and expectations shared among the organization's employees. Process maturity. đ?&#x2018;&#x20AC;đ? ?´ đ? ?´đ?&#x2018;&#x2013; : Arithmetic mean of the questions about Vision and Guidance, wheređ?&#x2018;&#x2013; = 1, 2, 3, 4 đ?&#x2018;&#x17D;đ?&#x2018;&#x203A;đ?&#x2018;&#x2018; 5. đ?&#x2018;&#x20AC;đ? ?´ đ? ?ľđ?&#x2018;&#x2013; : Arithmetic mean of the questions about Process, wheređ?&#x2018;&#x2013; = 1, 2, 3, 4 đ?&#x2018;&#x17D;đ?&#x2018;&#x203A;đ?&#x2018;&#x2018; 5. đ?&#x2018;&#x20AC;đ? ?´ đ? ?śđ?&#x2018;&#x2013;: Arithmetic mean of the questions about People, wheređ?&#x2018;&#x2013; = 1, 2, 3, 4 đ?&#x2018;&#x17D;đ?&#x2018;&#x203A;đ?&#x2018;&#x2018; 5. đ?&#x2018;&#x20AC;đ? ?´ đ? ?ˇđ?&#x2018;&#x2013; : Arithmetic mean of the questions about Technology, wheređ?&#x2018;&#x2013; = 1, 2, 3, 4 đ?&#x2018;&#x17D;đ?&#x2018;&#x203A;đ?&#x2018;&#x2018; 5. đ?&#x2018;&#x20AC;đ? ?´ đ? ?¸đ?&#x2018;&#x2013; : Arithmetic mean of questions about Culture, wheređ?&#x2018;&#x2013; = 1, 2, 3, 4 đ?&#x2018;&#x17D;đ?&#x2018;&#x203A;đ?&#x2018;&#x2018; 5. 4.1 Maturity Levels When finalizing the calculations using the PMF model and the guidelines established in the previous sections, the result obtained will vary from 0 (zero) to 5 (five), according to the scores assigned by the selected respondents. 5 M A Ai To classify the level of maturity of the A 1 4 organization analyzed,Silva (2012)makes Dim = i ď&#x20AC;˝1 5 a correlation between the scores obtained and Where, the five levels of maturity of the PMF model. This đ?&#x2018;&#x20AC;đ? ?´ đ? ?´1 : Arithmetic mean of the scores obtained for the first correlation is made using the score obtained in the question. https://dx.doi.org/10.22161/ijaers.6.4.20 maturity calculation using two decimal places, which identifies the level of maturity. Score variation and correlation with maturity level are available in Table 4. Table.4: Process Level of Maturity Score Level Less than or equal to 1,9 1 Initial Greater than or equal to 2 and less 2 Repetitive than or equal to 2,9 Greater than or equal to 3 and less 3 Defined than or equal to 3,9 Greater than or equal to 4 and less 4 Managed than or equal to 4,9 Equalto 5 5 Optimized Source: Adapted fromSilva (2012) V. RESULTS AND DISCUSSIONS The maturity survey was carried out according to the theoretical framework, using the evaluation method defined by the PMF model. For the context of UFGD, the functions set out in the IT Service Operation process analyzed were Service Center, Technical Management, Operations Management and Application Management. 5.1 Service Desk In the case of the UFGD Service Desk, Table 5 summarizes the maturity for each of the Dimensions analyzed and their classification in relation to the PMF model. Table.5: Maturity of the Dimensions of the Service Center UFGD Dimension Maturity Classification Vision andGuidance 1,10 Initial Processes 0,60 Initial People 1,20 Initial Technology 1,35 Initial Culture 0,95 Initial Fonte: Dados da Pesquisa The result obtained, when compared to the maturity levels shown in Table 4, reveals a deficit condition, classifying the UFGD Service Center dimensions as Initial, since none of the grades obtained was greater than 1.9. In Graph 1 the maturity of each one of the analyzed dimensions is arranged. Source: Research Data Following the survey of the causes that influence the institutional maturity of the Service Center, it is possible to point out some opportunities for improvement, such as :  Perform the analysis and modeling of the work process of the UFGD Service Desk, formalizing the process established and publicizing it  Establish a communication plan capable of properly integrating the staff involved in the Service Desk.  Identify the IT workforce available at the UFGD.  Establish a manager, able to control and monitor the process by aligning its execution to institutional goals.  Train the IT workforce for the integrated execution of the activities of this Role. Having pointed out the failure of the structure of points representing the Service Desk and presented some suggestions for improvement, it is up to the UFGD Corporate Governance, with the IT department to establish an action plan aiming at mitigating the identified flaws. 5.1 Technical Management The Technical Management focuses planning activities and study of institutional needs, being able to organize the best arrangement between the possibilities that this infrastructure can offer and the institutional demand. In general, this ITIL Model Function serves to coordinate the allocation of resources, being able to provide subsidies that justify the acquisition of IT infrastructure, Software or increasing the workforce in the organization. Table.8: summarizes the calculation of the grades obtained for this function from the ITIL model. MatProc = 0, 51 As indicated by the maturity of the Technical Management Function, the UFGD must carry out the planning for execution of the activities of this function. Table 9 consolidates the diagnosis of the UFGD Technical Management. Source: Research Data As in the Service Center and Technical Management, after conducting a survey of the causes that influence the maturity of Operations Management, us ing the good practices of the ITIL model, it is possible to point out some opportunities for improvement.  Modeling of the work process of the Operations Management in the UFGD, giving publicity and formalizing the means of communication to carry out its activities.  Establish a communication plan capable of properly integrating all the people involved in IT activities and encourage them to take part in the department decision-making.  Establish a manager with ability to control and monitor the process, aligning it with the institutional goals.  Training and qualification of the IT staff oriented towards their activities. The results show the need to understand and apply the good practices of ITIL. It is necessary to formulate a process with well defined rules and roles. 5.2 Application Management Application Management is the role responsible for planning and implementing the applications that support the organization's business processes. In general terms, it should be part of IT service planning, so that they are able to keep the business processes under operational conditions. As a result, poor institutional performance is evident. For this function, the UFGD did not reach the minimum score to leave the Initial level of maturity, when it has its performance compared to the definition given in Table 4. Table 14 summarizes the institutional maturity for each of the analyzed dimensions of the Application Operations . Table.14: UFGD Application Management Dimensions Dimension Maturity Classification Vision andGuidance 1,10 Initial Processes 0,80 Initial People 1,30 Initial Technology 0,55 Initial Culture 1,25 Initial Source: Research Data In order to elucidate the level of institutional maturity on the parameters defined in the ITIL and PMF models for Application Management, the maturity of each of the dimensions analyzed is shown in Figure 4. As with the Service Center, Technical Management and Operations Management Functions, the survey provided information that proposed factors that most influenced the maturity achieved for Application Management. Table 16 summarizes what the biggest impact on the results had obtained. 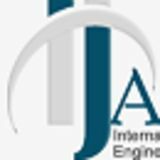 International Journal of Advanced Engineering Research and Science (IJAERS) https://dx.doi.org/10.22161/ijaers.6.4.20 Application Management. It is possible to observe some actions in this sense, however work is still needed to create a process with well-defined rules and attributions. Table.17: Causas para baixa Maturidade Institucional Function Main Causes of Low Maturity  Reduced staff;  Inefficiency of human and material resources;  Limited view of the role of IT Service Desk by the Administration  Lack of integration between the different IT teams  Lackof IT Planning  Lack of Linkage between the goals of the organization and the objectives of the Role  Absence of an administrative Application vision, aimed at continuous Management improvement  Low perception about the importance of automation for the management of services  ReducedStaffing  Deficiencyofinternal communication Operations  Absence of an administrative Management vision, aimed at continuous improvement  Lack of integration between the different IT teams  ReducedStaffing  Absence of an administrative vision, aimed at continuous Technical improvement Management  Lack of integration between the different IT teams  Lackof IT Planning Source: Research Data By consolidating the results obtained in the previous sections through the PMF model, it was possible to obtain a systemic view of the condition of the Functions of the ITIL Model in UFGD. The use of the model was able to extract, through its dimensions, the necessary improvements to raise the level of maturity of the ITIL Functions in UFGD, and it is possible to point out the following actions as initial steps to increase the institutional indicators.  Elaboration of a plan of actions to increase maturity in each of the Functions analyzed.  Defining a responsible manager for each of the functions, and prior training is required to coordinate the alignment process with the principles of the ITIL model.  Modeling the processes for each function seeking to integrate the functions that are related. International Journal of Advanced Engineering Research and Science (IJAERS) https://dx.doi.org/10.22161/ijaers.6.4.20 Request System), even with some level of difficulty. Moreover, a total of 15.4% stated to make a satisfactory control of their activities with their own tools (e-mail and spreadsheets), however for 10.3% these tools have not met their needs. This condition reinforces the need to change the current process so that the tool used can contemplate the management of the activities of the staff, giving them the means to control their activities b y improving the service provided. According to the data presented in the previous sections, the UFGD has a technical staff capable of promoting the improvement in IT services without the need for large financial investments. According to the above, the institution does not adhere to ITIL library standards, while at the same time revealing an environment where actions do not form a well-defined pattern or process . Fig. 4 represents the current flow that the requests follow. Clients do not have a defined communication channel. Instead of they may ask a unit technician to service without the intervention or knowledge of the IT department. Only in cases where the technician needs support or permission to perform the service, the IT department interacts with the request. In general terms, what is observed is that the institution has the necessary conditions to implement a good management of IT services. As the research shows, the staff has adequate training and is present in adequate numbers. What the institution lacks is awareness of IT Service Management, a condition that was evident when analyzing the institutional maturity of the ITIL library. In this way, the work points to the model presented in Fig. 5 as a suggestion to change the current process so that it is able to adhere, even if in a primary form, to good ITIL practices, taking advantage of the available structure and resources. Considering the experience brought by the ITIL library and the observation of the process establis hed in the UFGD, it is clear that the Client is the agent responsible for initiating the request, being the only one able to attest its compliance. As recommended in the ITIL library, a request can be made from a variety of means of communication, being available in these phases, the currently available call system (OTRS), the sending of an e-mail message or a telephone call. With these resources, the client is able to inform the need for a service, reporting the problem and the current need. The Client's performance model in the presented proposal is exemplified in Fig 3. Fig.3: Customer Service at the Service Desk (The Author) With the possibility of opening an order, the customer also interacts in the closing process, responding to a satisfaction survey and informing the level of quality of the service received. The level of satisfaction should serve as a parameter to evaluate service delivery, and it is possible to reinsert the call in the service process if the user deems it necessary. Fig.4: Current IT Service Process of UFGD (O Author) The constant assessment of the quality of calls serves as feedback on the work of the Service Desk team, serving to evaluate the process instituted and possible improvements that can be applied. process, it must pass through the division so that it is sent to the survey of user satisfaction. 7.1.2 First LevelSupport First level support generally refers to simpler requests that require less technical knowledge or that are already part of the knowledge acquired by the team during the attendance of similar requests that occurred at other times. First-level calls, although characterized by its low complexity, usually occurs in large numbers and at high frequency. This condition requires that the responsible team has a good number of servers and is able to meet the demands distributed by the organization. As the UFGD has a structure composed of several blocks, the service team at this level must be able to traverse the entire structure, being distributed in a way to optimize its scope of action. The arrangement of the activities of the First Level Support is shown in Fig. 7. Fig. 5: Proposed Service Process of the Service Center of the UFGD (O Author). Fig. 7: First Level Support (O Author) 7.1.1 Customer Service Division â&#x20AC;&#x201C; DAU As part of the organization chart of the IT department and having among its duties the receipt, scheduling and fulfillment of requests, the DAU is responsible for classifying the demands received. It is able to identify the specifics of each call and assign to the team better trained. As the teams are distributed according to their focus of action, DAU concentrates a portion of the workforce responsible for performing first-level calls. In the process presented, this responsibility is shared with the technicians designated in other units, and this division is responsible for the classification and scheduling of the team responsible for the service, whether internal to the IT department or the unit responsible for the demand received. The layout of the Division and its functions are shown in Fig. 6.
International Journal of Advanced Engineering Research and Science (IJAERS) https://dx.doi.org/10.22161/ijaers.6.4.20 Because the changes suggested in the current Service Desk process involve significant changes, it is possible that second-level support is affected. The changes must prioritize the action in problem solving and favor the performance of the first level teams, giving them the necessary subsidies to carry out their activities. The arrangement of the activities of the Second Level Support is shown in Fig. 8. Fig. 8: Second Level Support (O Author) 7.1.4 ThirdLevelSupport Third-level support is not predicted for in the current process. In the proposal presented it comes into existence, being responsible for receiving all the demands that have already passed the first and second level of support. Usually requests that reach this level are those that require some sort of financial investment or acquisition, so that beyond the operational scope of the Service Desk performance. The third level is responsible for resolving non-technical issues that prevent the progress of solving the demand received. In general, its participation in the process is quite simple, having its attributions arranged in Fig. 9. HUNNEBECK, L. ITIL Service Design. Lon: TSO (The Stationery Office), 2011. KLIMKO, G. Knowledge Management and Maturity Models: Building Common Understanding. [s. l.], 2001. LLOYD, V.; RUDD, C. Service Design ITIL v3. ITIL Library, [s. l.], v. 86, n. 4, p. 1–82, 2008. LONG, J. O. Continual service improvement. London: TSO (The Stationery Office) and, 2012. MAGALHÃES, I. L.; PINHEIRO, W. B. Gerenciamento de Serviços de TI na Prática: Uma abordagem com base na ITIL. [s. l.], p. 672, 2007. MORGADO, A. C. de O.; CARVALHO, P. C. P. Matemática Discreta. 2o ed. Rio de Janeiro: SBM, 2015. NIETO, T. L. et al. Implementing an IT service information management framework: The case of COTEMAR. International Journal of Information Management, [s. l.], v. 32, n. 6, p. 589–594, 2012. PEREIRA, R.; SILVA, M. M. Da. ITIL maturity model. Information Systems and Technologies (CISTI), 2010 5th Iberian Conference on, [s. l.], n. May, p. 1–6, 2010. RANCE, S. ITIl Service Transition. [s. l.], v. 11, n. 1, p. 364, 2011. SILVA, L. C. Da. Avaliação do Modelo ITIL: Uma Abordagem Prática. [s. l.], 2012. UFGD. Relatório de gestão do exercício de 2016. [s. l.], p. 237, 2016. UFGD, U. F. da G. D. Plano de Desenvolvimento Instituicional. 2013..  VITORIANO, M. A. V.; SOUZA, J. N. A Percepção de Gestores da Administração Direta Federal Quanto ao Nível de Maturidade dos Processos de Gerenciamento de Serviços de Tecnologia da Informação. [s. l.], 2015. WEILL, P.; ROSS, J. W. Governança de TI Tecnologia da Informação. IT Governance, [s. l.], n. Harvard Business School Press Boston, Massachusetts, p. 1–10, 2004.